The Annual General Meeting of the Library and Information Services Council of Northern Ireland was held on Wednesday 29 September in the Antrim Library. Hazel Hall was delighted to attend as the guest keynote speaker, particularly because it gave her the chance to meet colleagues in Ireland who are now connected to the work of the Coalition through COLICO’s associate membership (as reported here on the Coalition blog in July). The venue for the meeting was also of interest: although the new Antrim Library has been open to the public since February 2010, it was only officially opened last week, as reported by Libraries NI. As part of the formal business of the day some important announcements related to the support of LIS research by LISC in Northern Ireland were made. First, a bursary of £650 to support a Masters student at the University of Ulster has been offered. Secondly, a new prize of £150 will be awarded to an excellent dissertation from the Ulster course. Further details of these awards are available on the LISC NI blog posting about the AGM. Dr Jessica Bates also took the opportunity to update meeting participants on CPD courses for librarians to be held at the University of Ulster in November 2010. 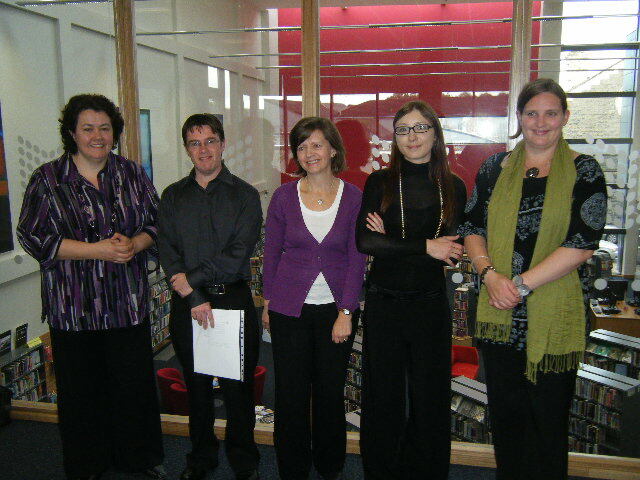 These are on demonstrating the impact of library services (8 November) and the use of social media (25 November). Further details are available on the leaflet about the courses. A fourth student, Francesca Fodale, presented her case study work on the role of the school library in the personal development of pupils. We wish all the students on the course the best for their submissions in December 2010. The last formal presentation of the day was given by Hazel Hall. 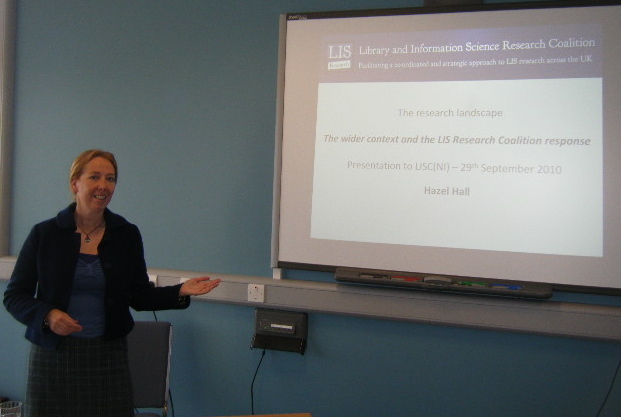 It was entitled “The research landscape: the wider context and the LIS Research Coalition Response”. The text below summarises Hazel’s main points. The presentation slides are available on Slideshare. Hazel gave a number of reasons why librarians should engage in research-led practice. Of these, she argued that the most important are: (1) to exploit the existing knowledge base for services improvement so that future decisions are made on the basis of real evidence; and (2) to enhance the value of prior research work by capitalising on the investment made in earlier research studies. 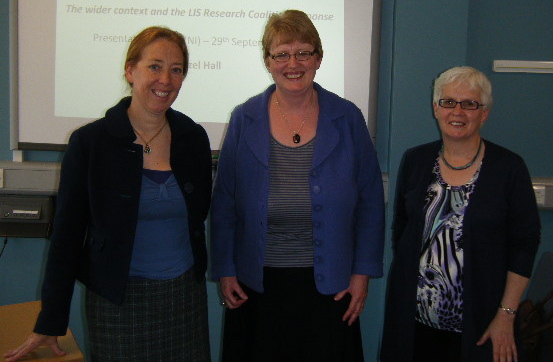 In addition, Hazel highlighted the value of encouraging librarians to undertake practitioner-led research. Of particular significance here is the pressing need for library practitioners to contribute to efforts to enlarge the evidence base that demonstrates the value and impact of library and information services delivery. This is crucial to convince politically important stakeholders of the need for further investment in services provision. Such work needs to extend beyond advocacy (the indisputable “libraries are a good thing” mantra) and the simple measurement of tangibles (for example, transactional data such as issue numbers). What is needed here are demonstrations of actual benefit, for example: how the service has contributed to the reduction of anti-social behaviour or the improvement of literacy amongst the community in a public library setting; how academic library services make a difference to research assessment ratings or improved student experience; or how innovations in information services delivery within a school have contributed to better exam results amongst the pupils. The drive towards research-led practice, and associated ambitions to enlarge the body of research-active librarians, faces a number of challenges. It was to these that Hazel then turned her attention. Whilst librarians recognise that in theory it is worthwhile to consult the output of earlier research studies as part of decision-making processes, for example in the development of a new service, few would do so as a matter of course. Rather than conduct a formal literature search to access a set of relevant research papers, often they would rely on first-hand experience and professional judgement in an action-orientated approach to their work. Here is interesting to note the irony that specialists in accessing published evidence to help other professionals plan a systematic approach to professional practice fail to do this themselves. Lack of time is often cited to justify an approach that ignores earlier studies. Hazel argued that this is with good reason. The multidisciplinary nature of librarianship research means that relevant papers are scattered across various domains. In addition, often the most significant source material comprises grey literature, such as unpublished internal studies and summaries of discussions on listservs. This is near impossible to locate, let alone access. In some cases, the most valuable research has not been published at all. The dearth of accessible published research studies emphasises why practising librarians themselves need to acknowledge their role in contributing to research efforts in librarianship as part of the larger research community that also includes academics, students and other researchers. 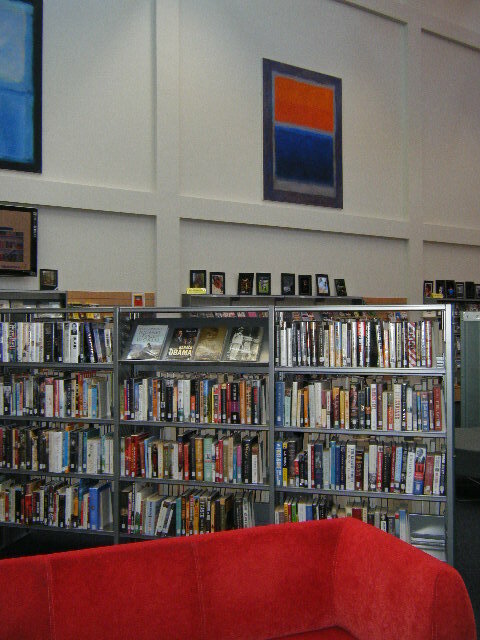 Currently many librarians simply do not consider research as part of their professional role. This holds true even in cases where they play a lead in the design and implementation of projects which – to an outsider – represent research activity. Much valuable knowledge is lost when such projects end, and their outcomes are disseminated only as far as a local audience, often when they would be of interest to professional colleagues beyond the home authority. Hazel explained how the LIS Research Coalition is therefore working to encourage librarians to reflect on how they may actively contribute to research efforts across the profession, as well as exploit the existing evidence base in their regular work. The efforts of the LIS Research Coalition acknowledge that the circumstances in which librarians work are often not ideal for the budding practitioner researcher. Time constraints of the practitioner role, low internal support of research activity and poor access to external research support, for example in the form of funding or research mentors, are all relevant external factors here. Individuals may also lack confidence in their own research competence due to limited knowledge of research approaches, coupled with a general failure to recognise their current research activity and skills as such. Hazel explained how the LIS Research Coalition has made publicly accessible a set of resources to save researchers’ time to address these concerns, principally through the web site and the Twitter feed at @LISResearch. She also mentioned how the LIS Research Coalition is involved in advocacy to persuade services managers of the need to support research initiatives; points to resources, as well as supports, events to extend the repertoire of research approaches in library and information science; and leads efforts to improve recognition of research knowledge within the profession. In short, the LIS Research Coalition is a focus for external research support in librarianship and information science. Hazel also acknowledged that individuals’ engagement in research also meets the personal priorities of staff as professionals. Intellectual stimulation, enjoyment of learning and pride in observing how the integration of research findings into work practice enhance services delivery all contribute to job satisfaction (and, from a manager’s point of view, the retention of talented individuals). Associated with this are career benefits. For example, profiles and reputations may grow on the basis of submissions to the journal and conference literature, and the skills of individuals increase through both formal and informal professional development activity undertaken in practitioner researcher roles. At the same time actual research output supports claims of the value of library and information services to individuals (for example, their social mobility, their educational opportunities), to citizens and society (for example, contributions to the enhancement of local communities, culture and heritage) and specialist user groups (for example, information provision to business to support economic development). A further role of research in this domain is to raise the profile of librarianship as a profession that is evidence-based across all sectors. For all these reasons the LIS Research Coalition facilitates a coordinated and strategic approach to Library and Information Science Research in the UK. The LIS Research Coalition welcomes the Committee on Library Co-operation in Ireland (COLICO) as a new associate member. COLICO functions to optimise the collective value of the combined resources of Irish libraries for their clienteles. The committee was established in 1977 and since 1994 has been the formal advisory body on library co-operation to An Chomhairle Leabharlanna, and the Library and Information Services Council, Northern Ireland (LISC NI). Further information can be found on COLICO’s web site. The news of COLICO’s involvement with the LIS Research Coalition has already been posted to the LISC NI blog. Linda Houston, Director of LISC NI, will serve as COLICO’s representative for the Coalition.